Customers are gaining more and more influence over the energy system. By far the largest number of our customers still purchase gas and electricity. But a rapidly growing number are now switching over to renewable forms of energy such as solar, wind or biogas. Our challenge is to facilitate this move towards local energy generation, while maintaining a highly reliable infrastructure at the lowest possible costs for everyone. 1 Number of registered connections with active feed-in installations in the Liander-service area. The transition to new forms of energy means that we need to renew our services to facilitate our customers as best we can. More effective matching of supply and demand is vital to help the electricity network cope with the acceleration in renewable generation and electrification. The increased local generation of wind and solar power poses formidable challenges for the electricity network. Sudden power peaks, for instance, can overload the local network. The availability of electricity is also less predictable, as solar and wind energy are prone to fluctuations. In the year under review, we initiated various experiments to test new services in partnership with customers. One example is the flexible charging of cars. Batteries charge faster in off-peak hours than at peak times, and off-peak charging reduces the load on the network. In Heerhugowaard we trialled a new flexible model for matching supply and demand in the energy market. And in Rijssenwoud, 35 households are taking part in a year-long pilot to test a neighbourhood battery for local electricity storage. A new wind farm can be seen along the motorway in the north of Nijmegen. The initiative was taken by a group of citizens who joined forces in an energy cooperative. The members and donors act as co-decision makers and co-investors. They also enjoy the benefit of 100% green power. The construction of the wind turbines started in April and the wind farm was completed in November. 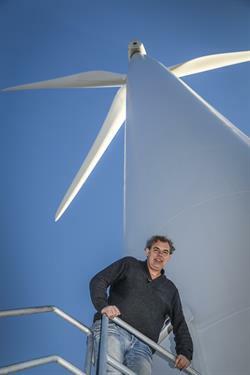 The wind farm is expected to yield energy for 8,900 households. Alliander has assisted in realising the project and finding the most effective energy supply method. One option is cable pooling, which involves the transmission of solar and wind energy through a single cable. This mode of supply is more efficient and cheaper. By making the built environment energy neutral, we can make a major contribution to the achievement of the CO2 objective. But that is a huge challenge. Alliander has therefore joined forces with housing associations and builders in a zero energy initiative called 'Stroomversnelling'. The construction of 11,000 zero energy homes got underway in 2016. These homes produce as much energy as they consume, leading to zero energy usage. The strategies include high-quality insulation, energy-efficient installations and renewable generation with on-site solar panels. The aim is to have a total of 4.5 million zero energy homes by 2050. So the pace must be stepped up. Within Alliander, we are pursuing innovative solutions to facilitate the energy transition. As local generation continues to increase, autonomous systems will become more commonplace. Examples are the energy supply on the 'Marker Wadden' islands, which we studied in 2016, and the island network at Schoteroog, which was ultimately called off. The Marker Wadden are islands in the Marker lake that are currently being constructed, primarily to restore the flora and fauna in the lake. The Society for the Preservation of Nature (Natuurmonumenten) has received the government concession to create and manage the islands. In 2016, we teamed up with Natuurmonumenten to discover how we could supply renewable energy to the future buildings on the island, such as the port and the research centre. Another project in 2016 was the Schoteroog island near Haarlem. We developed a plan for an autonomous island network for four local businesses. The absence of a traditional connection between the island network and the existing energy network meant we had to think out of the box. Local arrangements were necessary with parties who produce, store, distribute, consume and balance energy. Unfortunately, during the preparations in 2016, it proved impossible to find a solution that reconciled the intentions of the concept with existing laws and regulations. Matching supply and demand of electricity is becoming increasingly difficult. Storage is one solution that can help us manage peaks and troughs. The possibilities for storing energy are still limited, but we are closely monitoring the rapid advances in this area. We enter into partnerships and initiate pilot projects. One example in 2016 concerned the realisation of a local community energy storage battery. On sunny days, customers with solar panels feed their surpluses into our network. The problem is that our network cannot cope with the steadily growing amount of fed-in energy. The community battery is a local collective solution for solar overproduction. Consumers can store the energy they have generated in the central battery for later use. The first pilots with this local community battery are scheduled for 2017. Solar and wind energy is increasingly being generated locally. More and more people are also making sustainable choices, such as electric vehicles or heat pumps. This affects the design of the local network, says project manager Moniek Thissen of Alliander. “How do we deal with energy shortfalls and surpluses? Upgrading the network is not always desirable. Another solution is to encourage consumers to opt for flexible and smart energy management. We used the USEF (Universal Smart Energy Framework) market model for the first time in a smart testbed project ("Energiekoplopers").